Jim Hodges Productions is your source for audio book recordings of historical novels from G.A. Henty. I was excited to be selected to do a review of With Lee in Virginia, as well as the accompanying study guide in PDF format in our homeschool. My 14 year old son loves history, so this was an excellent opportunity for us to learn more about the American Civil War. All of the G.A. Henty audio book recordings from Jim Hodges Productions come in MP3 CD format. They can only be played on a computer CD drive, a DVD player, a laptop computer CD drive, or on a MP3 compatible CD player. You will not be able to play them on a standard CD player. The stories are best for ages 10 and up. With Lee in Virginia has a total run time of 11 hours and 20 minutes. Get ready to travel back in time as you and your child are introduced to many of the battles of the 1860's. There are 20 chapters to listen to. Here is a list of the chapter titles and times. 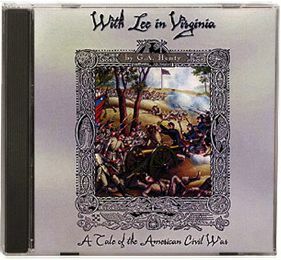 The price of the MP3 CD of With Lee in Virginia is $25. It's also available as a digital download for $18. The 58-page study guide for With Lee in Virginia has vocabulary word lists, storyline questions, history notes, geography notes, old-fashioned phrases and their meanings, activities to choose from, and a list of quality character traits. Answers to the storyline questions are provided as a guide for grading your child's work. If you and your child love to make timelines, you'll be happy to know that one of the activities included in the study guide is to make a Civil War timeline. There are also website links provided for additional activity choices. Other activity choices include cooking recipes from the time period, map work, artwork, poetry and music of the time period, and watching movie clips of key people during the time period. There are four quizzes included in the study guide. There is a quiz after every five chapters. The price of the study guide for With Lee in Virginia is only $12.00. This study guide is a fantastic resource to use alongside of the MP3 CD for a unit study on the American Civil War. For the vocabulary words, your child is asked to look up the word and write its definition so you will need a dictionary. The vocabulary words are formatted into a table in the study guide with space for your child to write the definition, so don't worry about getting a separate notebook or index cards. I love the list of quality character traits that is included on the last page of the study guide!! One of my main goals this year in our homeschool was to focus on character traits with my 14 year old son. This list contains 49 character traits any parent would be thrilled to see developed in their child! Each character trait is discussed in the storyline questions as your child is asked to choose a particular character trait to describe the actions of the characters in the story. We are listening to one chapter a week and working in the study guide. Before listening to the chapter, we work on the vocabulary words, so my son will be familiar with them as they come up within the storyline. After we have listened to an entire chapter, I then have my son complete the storyline questions. On Fridays we usually pick at least one activity and complete it. My son and I have loved listening to With Lee in Virginia! The study guide has been a wonderful resource to help us in our unit study on the American Civil War. We have been able to pick and choose from the activities suggested at the end of each chapter in the study guide which has given hands-on opportunities to make our study fun. If you are looking for audio books to use in your homeschool, you will definitely want to check out Jim Hodges Productions. You can hear Jim Hodges give a description of each title available on the Jim Hodges Productions website at the Jim Hodges Audio Books channel on YouTube. You can connect with Jim Hodges Productions on Facebook. Jim also has an email list you can sign up for here (under the @ on the left hand side of the website). Once you sign up, you'll be able to receive news on sales, new titles, and special promotions. To read more reviews on other family friendly audio books available from Jim Hodges Productions, click on the link below.